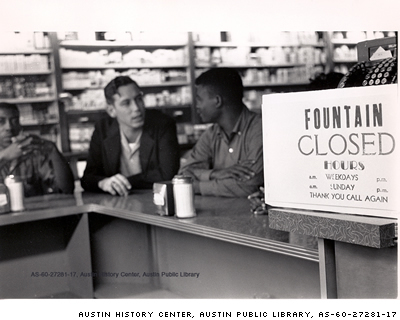 White and African American students from Austin area colleges sit in at a segregated lunch counter on Congress Avenue in Austin, April 1960 as part of a concerted effort to integrate lunch counters. 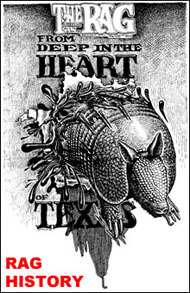 Image from Austin History Center. Part 13: 1954-1973/1 — Civil rights efforts to desegregate schools, public facilities, have wide success. The main losses in Texas were the OCAW, which had 31,000 members in 1955 and about 20,000 in 1964; and UAW, whose membership had declined from 16,057 in 1955 to about 14,000 in 1964; the carpenters, who had 27,321 members in Texas in 1957 and about 15,000 in 1964; the packinghouse workers, who had 2,035 members in 1955 and 1,200 in 1964; and the textile workers who had 720 members in 1955 and only 185 in 1964. The main unions to gain membership in Texas between 1960 and 1964 were the American Federation of Government Employees, the National Association of Letter Carriers, the state, county and municipal employees; the International Brotherhood of Electrical Workers and the Amalgamated Meat Cutters. By 1960, the number of African-Americans who still lived in rural Texas had dropped to 256,750 and the number of African-American tenant farmers and sharecroppers in Texas had dropped to 3,138, while the number of African-Americans in Texas who still owned their own farms had declined from 52,751 in 1940 to 15,041 by 1960. And “by 1960 only 8 percent of all black workers in Texas remained in rural areas — a sharp decline from the 32 percent of two decades before,” according to Alwyn Barr’s Black Texans. But, in contrast, the “urban black population in Texas grew from 428,110 in 1940 to 905,089 in 1960,” according to the same book. Although “Texas Attorney General John Ben Shepperd made a concerted effort to drive the NAACP out of Texas by suing the association” in 1956, according to Merline Pitre’s In Struggle Against Jim Crow, after the 1954 U.S. Supreme Court decision ruled that racial segregation in U.S. public school systems was unconstitutional, African-American civil rights activists in Texas continued to protest against racism within Texas society during the 1950s and 1960s; and — despite the political opposition of some white Texans who wanted to preserve legalized segregation in the state — were able to win some of their anti-racist demands between 1954 and 1973. As Black Texans recalled, “protests by local black organizations and court cases brought the integration of publicly owned restaurants, golf courses, parks, beaches and rest rooms in Houston, Beaumont, and other Texas cities during the 1950s.” In 1954, for example, Houston ’s public golf course and public library were desegregated; and between 1954 and 1956 all major Texas cities ended racial separation on their city buses. Yet, “at Texarkana College in 1955 — a crowd of whites prevented blacks from enrolling” and “White Citizens Councils, an anti-desegregation group…appeared in Texas during the summer of 1955 and soon claimed a membership of 20,000,” according to Randolph Campbell’s Gone To Texas, with 250 delegates attending its 1955 convention. And, “although enrollment at UT was fully integrated by 1956, blacks were banned from varsity athletics and relegated to segregated and substandard dormitories;” and “Austin in the early 1950s was still segregated in most respects — restaurants, hotels, movie theaters, drug stores, public schools, parks, swimming pools, hospitals, housing and public transportation,” according to David Humphrey’s Austin: An Illustrated History. Near Fort Worth, “forceful opposition to school integration at Mansfield” also developed in the fall of 1956 “when over 250 whites stopped the entry of black pupils into formerly white schools” and then-Democratic Texas Governor Shivers “used Texas Rangers, not to disperse the mob, but to remove the students,” according to Black Texans; and “Mansfield schools remained segregated for at least two more years,” despite the 1954 U.S. Supreme Court ruling, according to the same book. Houston also still had the largest racially segregated public school system in the United States in 1957. And while Southern Methodist University (SMU) administrators finally began allowing African-American applicants to attend this college in 1955, Texas Tech, Rice University , Baylor University, and Texas Christian University administrators apparently didn’t allow African-American applicants to become students on their campuses until 1960. 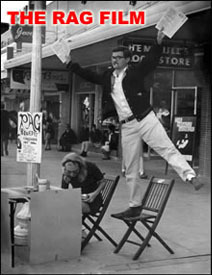 In the early 1960s black and white students from Texas Southern University in Houston, the University of Texas in Austin, and other colleges across the state began to protest restaurant and theater segregation. Bishop and Wiley college students in Marshall undertook one of the first series of non-violent demonstrations in Texas during the spring of 1960. Prairie View students with limited white support boycotted Hempstead merchants in the fall of 1963. 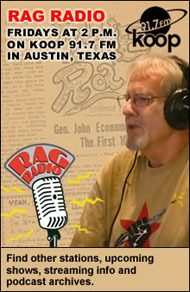 At UT in Austin (whose student body included only around 200 African-American students in 1961), the Students for Direct Action campus group (which was founded in the fall of 1960) also picketed in 1962 at “the Forty Acres Club, a newly-opened private “whites-only” faculty club often used for university meetings and entertaining official university visitors,” according to the 1988 “History of Student Activism at the University of Texas at Austin (1960-1988)” thesis by Beverly Burr that was posted on the UT Watch website. And in the fall of 1962 student activists on UT’s campus also founded the Negroes for Equal Rights (NER) and Campus Interracial Committee [CIC] campus civil rights groups which were successful in pressuring the University of Texas administration to finally hire its first African-American faculty member (an assistant professor of civil engineering named Ervin Perry) in May 1964; and to finally allow African-Americans to become members of the UT faculty’s Forty Acres Club in March 1965. Yet despite the early 60s civil rights protests in Austin, as late as the fall of 1963, Austin’s 24,413 African-American residents “were still barred from half or more of Austin’s white-owned restaurants, hotels, and motels and from business schools and bowling alleys,” “9 out of 10 black elementary-age children attended schools that were at least 99 percent black” and “discrimination in employment and housing was common,” according to Austin: An Illustrated History. So, not surprisingly, Austin’s NAACP chapter held a six-day civil rights filibuster at an April 1964 meeting of Austin’s City Council to demand that it pass an anti-discrimination ordinance; and Joan Baez even appeared at a“freedom hootenanny” in the front of Austin’s City Hall before an audience of 200 local civil rights movement supporters on the first day of this Austin NAACP civil rights filibuster. 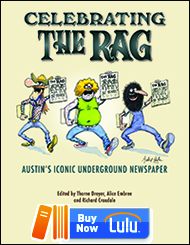 This entry was posted in Rag Bloggers and tagged Bob Feldman, Campuses, Civil Rights Movement, Direct Action, Segregation, Sixties, Texas History, UT-Austin. Bookmark the permalink.